Man, that one picture was more trouble than I expected. I like Touhou for many, many reasons, among them are the cross overs. 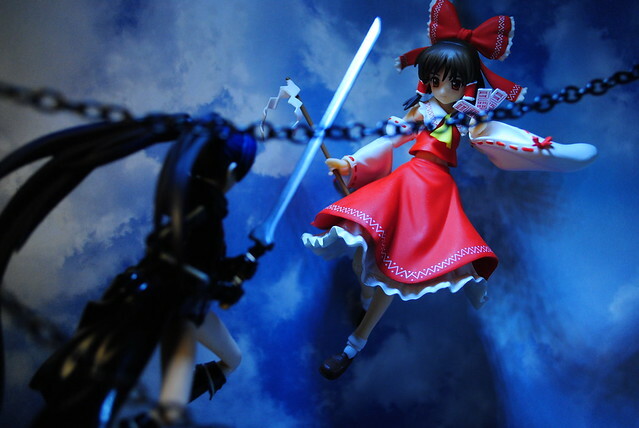 Recently I saw a Touhou x BRS drawing that inspired me to take the above picture. However, this wasn't without trouble. Have you ever had this image in your head that no matter how hard you try you just can't put into words, draw, etc. I had this image for a picture that I wanted to take but no matter how many pictures I took, how I moved the figures around or changed the angles and lighting I couldn't get it exactly right. This is highly annoying but that's that. The above picture was one of the many I took.